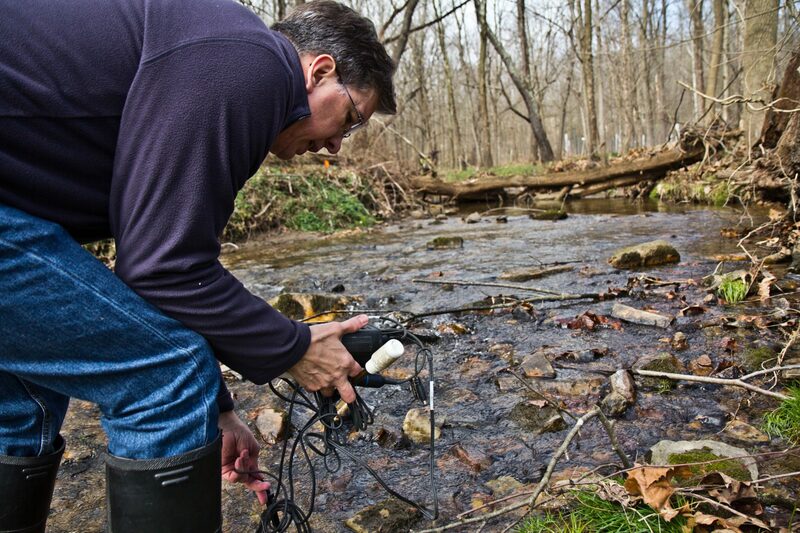 John Jackson, a senior research scientist at the Stroud Water Research Center, measures conductivity at the White Clay Creek at the center. Applying salt on roads and sidewalks during storm events is a safety issue — it helps keep roads drivable during winter and can prevent people from falling when it’s icy. But there’s a cost: Studies show that salt ends up running into streams and rivers, raising chloride and sodium levels in fresh waters across the country, which hurts the environment and can threaten public health. John Jackson, a senior research scientist at the Stroud Water Research Center, has been studying water quality in the Delaware River watershed for 28 years. Currently, he’s looking at the increasing salt concentration in surface waters from streams in Pennsylvania and the White Clay Creek at the Stroud Center, and its negative impact on aquatic organisms. On Tuesday, a day before this week’s snowstorm, Jackson put a portable meter into the creek to measure conductivity, which shows the amount of salt dissolved in the water. Jackson said salt levels in streams have increased dramatically since the 1950s, when the use of salt to counter snow and ice began. A study shows average concentrations of chloride almost doubled from 1990 to 2011. Salt is very soluble, and chloride and sodium dissolve into the melted snow, travel into the storm sewer and end up in waterways. Part of that salty water gets absorbed and ends up in the groundwater. Sodium chloride helps people keep their footing when there is snow or ice on walkways. But when it ends up in streams, it can harm wildlife. “So it ends up in people’s wells, it ends up in their drinking water and potentially impacting life in the stream,” Jackson said. To study the effect of the increase of salt in the watershed, Jackson is looking at mayflies. There are 57 species at the White Clay Creek at the Stroud Center, which the state has designated as an Exceptional Value stream, with the highest existing water quality and special protections. Mayflies are a species older than dinosaurs, and Jackson says they are the canaries in the coal mine when it comes to water quality. “By picking up rocks, if I find a bunch of mayflies I know it’s clean water. And if I’m not finding them, there’s a good chance there’s a problem in this waterway,” Jackson said. The Stroud Center and local partners constantly monitor about 30 sites in the Delaware River watershed and said chloride levels are increasing even in the summer. That’s because groundwater gets contaminated with salt in the winter, and it eventually flows into the streams. In the winter, they’re seeing conductivity go up from 900 to 6,000 uS/cm in sites like the Wissahickon, reaching up to 1,800 milligrams of chloride per liter. Jackson is trying to figure out the toxicity of chloride in the mayflies, to establish criteria for aquatic life in Pennsylvania, which has standards only for drinking water. The aquatic life criteria for chloride published by the U.S. Environmental Protection Agency in 1988 — 230 milligrams per liter for a 4-day average of continued concentration, or 860 for a 1-hour average maximum concentration —- was withdrawn to undergo more studies. And the Stroud Center was contracted to conduct them. What Jackson is finding is that mayflies definitely don’t like chronic concentrations of chloride higher than 200 to 300 mg Cl/L during their life cycle, which is only 30 days. “There are measurable impacts, negative things, they grow more slowly, their survivorship decreases, they come out smaller — so physiologically they’re stressing, and in some cases, they’re dying,” Jackson said. And when mayflies die, the stream’s whole food chain is affected, including fish, insects, and birds. But high levels of salt in streams affects more than the environment. Dr. Hongbing Sun specializes in hydrology and water and soil quality related issues. He’s a professor of geological and environmental sciences at Rider University in New Jersey and has been studying the levels of salt in the Delaware River at Trenton for more than 18 years. His research shows that since 1945, the levels of chloride in the river have increased 7.6 times and the concentration of sodium has grown 4.5 times. “So, it’s actually not just a little increase,” Sun said. His study also shows that since 2008, the sodium concentrations in the Delaware River at Trenton were above the 20 milligrams per liter limit recommended by the EPA and the American Heart Association in five periods. And he found that the largest source of salt in the river is winter de-icing, which contributes about two-thirds of the total sodium input to the watershed. Researchers are studying what happens when sodium chloride, used as a de-icer, gets into streams and groundwater. Other causes of sodium and chloride increase include fertilizers used in agriculture, wastewater treatment plants, and water softeners. An emerging concern in Pennsylvania is discharge produced water from unconventional oil and gas development. According to the American Heart Association, high levels of sodium increase high blood pressure and heart disease, particularly in senior citizens. “There’s a high chance you get cardiovascular diseases like stroke, heart attack, and those things,” Sun said. During the 2016 – 2017 winter season, Pennsylvania Department of Transportation used 9.8 million gallons of salt brine and 900,000 tons of salt to help keep drivers moving. During the same season, the State of New Jersey Department of Transportation used 233,000 tons of salt and 1,638,000 gallons of salt brine. But states are not the only one using salt. So are municipalities — Philadelphia used 21,000 tons of salt in 2016-2017 — private developments and residents. States are experimenting with other alternatives to avoid harming waterways and concrete infrastructure — such as surfaces that can de-ice themselves. But in Pennsylvania, salt is still the go-to tool. In the meantime, Jackson said people should moderate their use of salt, and try to use alternatives such as sand or gravel. Or a good shovel.